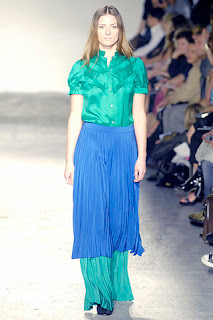 I promise this will be the last from Veronique Branquinho, but these shots from the Spring 08 collection caught my eye. The last time I tried layering two bottoms over each other was around 9 years ago when the ubiquitous 'skouser' (mini-skirt attached to a pair of trousers) was the official must-have fashion item amongst primary school girls (please tell me my friends and I weren't the only ones??). These outfits most likely consist of one skirt or dress, with several layers of different coloured fabrics. You could just as easily get this look by wearing a dress over a long skirt or a shorter skirt over a longer one. I still haven't made my mind up if I'd try this out though, would you? The turquoise and blue colors are beautiful. Oh, and we also had this terrible miniskirt and trouser-fashion here! i so much love the color combinations, however i will never layer up. Here in Bristol everyone is layering. 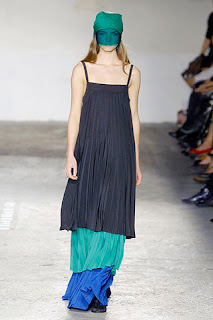 Long tunics over trousers and skirts, mini ra-ra skirts over trousers, all varieties. It's great because as it's the fashion for everyone, not onlu Muslims, it means the shops are full of things that can be worn over a pair of jeans and make them modest. The only thing is it's difficult, although not impossible to tops with long sleeves. love the colours but not so much the style. i do layer, but not as much. salams, i'm always with the layers, i wear colourful abayas so to give it extra volume i wear a skirt underneath so that the material does not stick to my legs but instead the abaya flows out. It's a nice unique style but personally I wouldn't have the confidence to wear it myself, would get too many looks! nah...not for me. just looked like the designer just wasn't inspired enough. sorry. 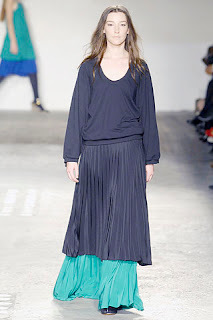 The layered skirt and dress or pants look made my previous wardrobe more hijabi friendly. I kept many dresses and skirts which were knee length-ish. My girl friend, Muslimah and Rasta taught me the fun of layering longer skirts together. As long as the skirts scarves and all compliment each other people will ask if the ensemble was made that way or a multi-later skirt. we had the skouser fashion too! except we called them trouser skirts, hehe. OH nooo...the skirts over trousers...don't remind me! Ahh, those shameful days.